Home > NEW PARTS > Master & Slave Cylinders, Rebuild Kits & Levers > Magura Master Cylinder Rebuild Kits > FRONT BRAKE MASTER CYL REBUILD KITS > New Magura COMPLETE 20mm Front Brake Master Cylinder Rebuild Kit For All K1004V/K1100 & R850/1100 (Except R1100S) Bikes. New ItemNew Magura COMPLETE 20mm Front Brake Master Cylinder Rebuild Kit For All K1004V/K1100 & R850/1100 (Except R1100S) Bikes. 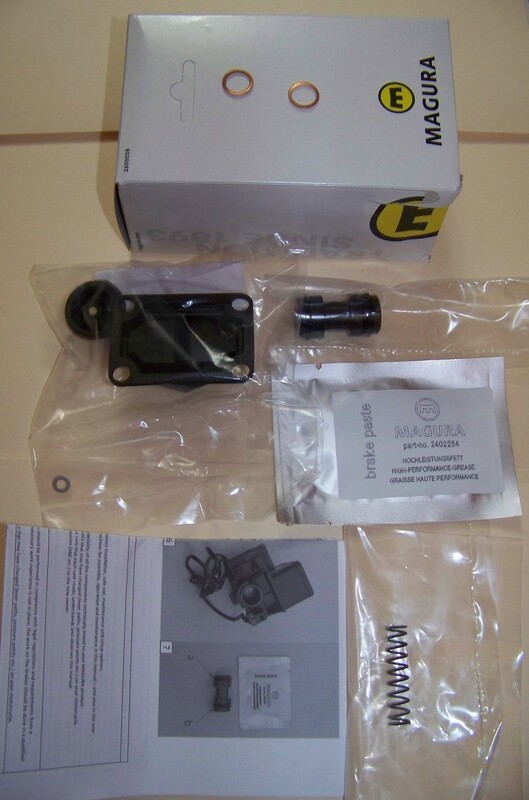 Finally available from Magura, the OEM manufacturer of the master cylinder is this new COMPLETE 20mm rebuild kit for the front brake brake master cylinder on all K100 4V, k1100 and R850/1100 bikes except the R1100S. Don't let your dealer tell you that you need to buy a complete master cylinder when yours leaks, use this kit COMPLETE to rebuild yours!! This kit includes the piston with seals installed, rubber insert for reservoir, spring, outer dust boot, set screw washer and banjo bolt washers for brake line. To get these parts from a BMW dealer it would cost $127.